The Federal Reserve took a sharply less aggressive policy posture on Wednesday, signaling it will not hike interest rates this year amid a slowing economy and announcing a plan to end its balance sheet reduction program by September. 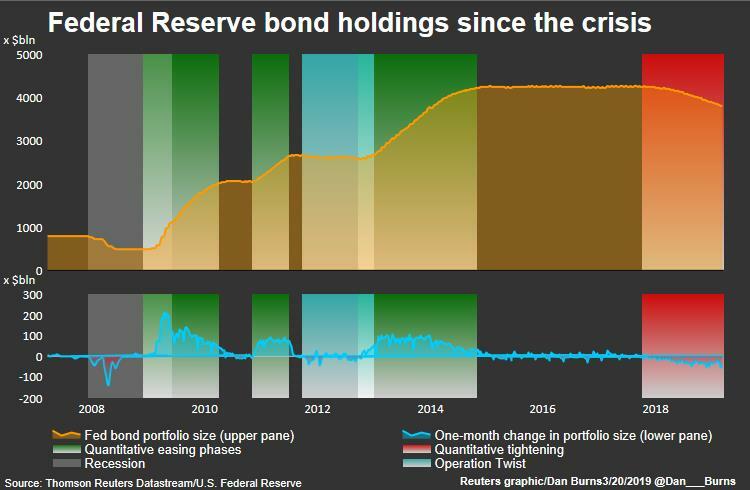 The U.S. central bank reiterated its pledge to be “patient” on monetary policy, and said it would start slowing the reduction of its holdings of Treasury bonds in May, lowering its monthly cap to $15 billion from $30 billion. Benchmark U.S. stock market indexes swung higher after the Fed’s statement was released, and key Treasury security yields dropped to the lowest since early January. The dollar weakened broadly against major trading partners’ currencies. Nonetheless, the Fed’s rate-setting committee said it viewed “sustained” growth as the most likely outcome. The new projections amounted to a wholesale downgrade of the Fed’s outlook, with at least nine of its 17 policymakers lowering their expected rate path and collectively shaving a full half of a percentage point off the expected fed funds rate at the end of this year. The Fed’s policy statement was unanimous.